Clarissa doesn't explain it all: Flowers and organizers...oh my!!! It has been a few days since I posted but that was because my BEST EVER EVER FRIEND (BEEF) came into town from Canada and I had to see her! I miss working and hanging out with my friend. Tricia and I had a wonderful time with her! So excuse my absense this weekend. 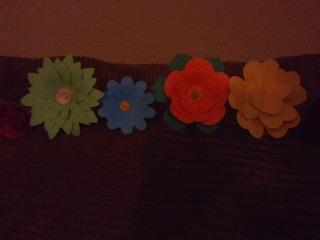 Today was craft day! I look forward to these days when I can create things. That is what I consider relaxing! My great and talented friends (Tricia and Amy) came over to craft. We were one a mission....create bouquets of flowers! My best friend Tricia is getting married in October to a wonderful man and I am honored to be a part of her day. Her vision is to create hand made bouquets. (Thanks Pinterest!) I knew this would be a daunting task but I also realized it would be quite fun. 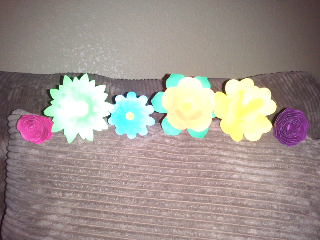 Today was to determine which kinds of flowers we would make. 6 hours later (watching tv, fooling around with different cricut cartridges, telling stories, and eating snacks) we finally came up with the "rought drafts" of what would work. I have included photos below. I am so excited. We have an army of crafting assemblers but we need to collect the paper and set a date. I think I may need to purchase stuff for mimosas too! 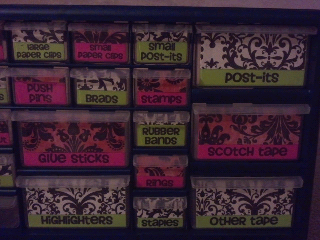 This evening was dedicated to creating a classroom craft that was on my "to do" list. I had seen this post on several peoples Pinterest account. 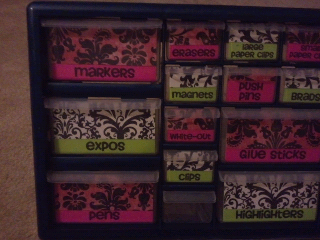 Thanks to Rebecca and Tara (two awesome teachers) that both did this project and created this awesome organizer. So excited to fill it tomorrow but I also included pictures of my own. Snuggles having a lazy day today. She was given lots of love today and she was a little sick. 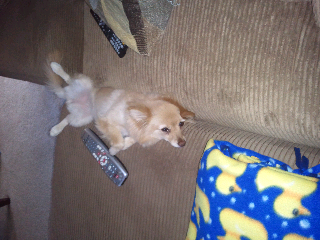 She looks comfy! Oh geez! This is only a part of the mess I made in the house today. 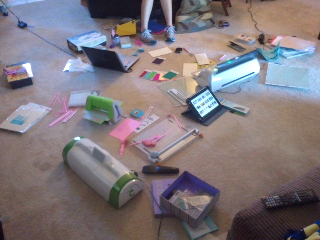 Yes, you are seeing two Cricut machines. I want to see my older one but it's tried and true so I end up using both today. LOL! the other half...the bottom is empty because I wasn't sure what to put in there but I think I may do crayons. The bigger flowers without the flash. Part of the finished product of sample flowers for my friends bouquets.